Excerpted from the "Small Guide to Visitors of the Exhibition Cave" by The association "Les Amis de Trôo". The origins of the ancient township of Trôo are lost in antiquity, but traces of its importance as a medieval "city" can be seen today by visiting the heights of the village, where remains are visible -- remains of a double surrounding fortified wall, dominated by a feudal mound and a splendid roman collegiate church. The hillside, now covered with greenery, reaches a height of 129 meters and was carved from rock in various layers, in which caves were dug to form many picturesque habitations in bygone days. Now there is a laze of little lanes and paths, plus ancient dwellings, arranged in tiers, rather like a wedding cake, all of which blend harmoniously into the landscape overlooking the valley below. In this valley, in the midst of meadows, the river Loir, fringed by poplars, drifts gently on its way. On the opposite bank, there is the tiny church of Sanit-Jacques-des-Guérets, once a haven for ancient pilgrims on "la route de la Compostelle" and which today is famous for its 10th century frescoes. 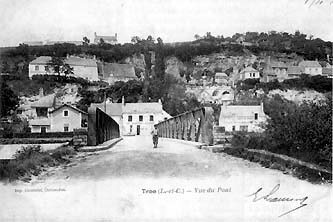 What is generally realized is that Trôo was once almost an English town, when it passed through the merciless wars between Philippe-Auguste and Richard the Lionhearted, towards the end of the XIIth century. 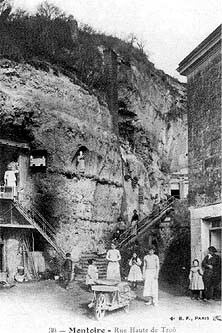 It was before that, in fact, in the XIth century, when the "troglodyte" subterranean network and surrounding fortified walls formed the formidable defense systems, when Geoffrey Martel faced Gervais, bishop of Le Mans, also Foulques Le Jeune, count of Anjou and English king Henri I. It was during the XIth and XIIth centuries that Trôo, the high fortified town, achieved its period of relative prosperity. hard to believe, but in those days, Trôo had around 4500 inhabitants, mostly cave-dwellers. Today, Trôo's modern population only numbers a few hundred, but the historic, cultural and archeological links are still evident to the thousands of visitors who pass through its lanes every year.